Major Religions - Are they essentially the same? We frequently hear the opinion that all the religions are basically the same. The problem with this belief is that if it were true there would not be so much strife between the various religions. 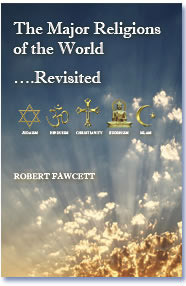 However, the belief about similarities between the various major religions is not entirely wrong. Most of the religions teach about living an ethically and morally upright life. They revolve around a God or an ideal that has to be achieved by the followers. But these similarities are layered with so many divergent beliefs, practices and cultures that the similarities are, for all practical purposes, rendered ineffective. If one compares the differences between the beliefs of the various major world religions, one would be able to understand how they are quite different from each other. In fact the other popular opinion that the different religions simply offer different paths to reach the same destination would also be rendered false. Judaism is about following a set of ethics as mentioned in the Hebrew Bible. Jewish Scriptures are not clear about the details of the afterlife. The set of ethics that the Jews have to follow are the Commandments and the Laws, which are believed to have been revealed by God. The Jews also believe that a Messiah will come in the future to lead them to God. They however do not believe that this Messiah was Jesus Christ. This is where they differ from the Christians. For Christians Christ is believed to be the son of God and those who believe in him and his teachings, and live life as prescribed by him, would be rewarded with an eternal and joyful life with God in heaven. Islam the biggest religion after Christianity has some major differences when it comes to the basic beliefs. The Muslims regard Jesus Christ as a prophet, but they do not believe that he is the son of god. They follow the teachings of Muhammad, to whom God revealed his will, in the form of the Quran. The religions of Hinduism and Buddhism are significantly different from the Abrahamic religions of Judaism, Christianity and Islam. Hinduism and Buddhism believe in the cycle of birth and death. Where the Hindus worship several gods, with the Supreme Creator being Brahman, the Buddhists do not believe in gods. For both the Hindus and the Buddhists, the ideal state is to get free from the cycle of birth and death by attaining Moksha or Nirvana.